The General Purpose Hydraulic Power Source powers earth drills and a broad array of other hydraulic tools, including concrete saws, breakers, tampers, and chain saws. 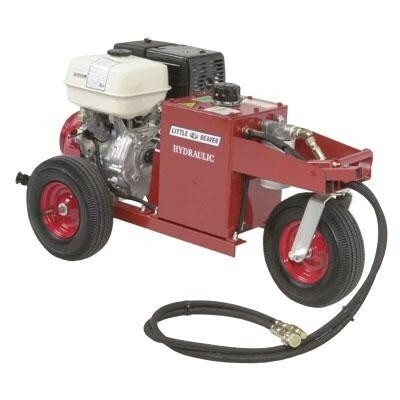 This versatile Power Source features an attaching point for the torque tube, oil cooler with 10" fan and a 4 gallon fuel tank for dependable, all day operation. The Power Source can be secured in the back of a truck or mounted on optional two or three wheel carriages for in-the-field portability and maneuverability. By combining higher horsepower engines with the reversibility, reliability and convenience of hydraulic drive, hydraulic earth drills are ideal for drilling in rocky or heavy clay soils. With their extra torque, these powerful earth drills can handle augers up to 16" in diameter and can drill depths of up to 30´ with 12" or smaller diameter augers depending on soil conditions. A forward/reverse lever lets you remove the auger if it gets caught under an obstruction, such as a rock or tree root. Even with all this power, most hole drilling remains a one-man operation, thanks to our patented torque tube. The torque tube eliminates the kickback found on competitive earth drills, making one-man drilling safe, fast and productive. Convenient front and rear handles make it easy to load the hydraulic earth drill into and out of your truck. *1 (ONE) Year Limited Warranty to replace for the original purchaser, free of charge, any part or parts, found upon examination by any factory authorized service center, or by the factory at Livingston, Texas, to be defective in material or workmanship or both. If your equipment cannot be repaired, it will be replaced. All transportation charges on parts submitted for replacement under this warranty must be borne by purchaser.